Yusmeiro Petit is once again hoping his Venezuelan Winter Ball showing will help him get another shot in the bigs. Lorenzo Cain is a dude that’s been on our radar for many years, and in recent seasons, we’ve been sort of waiting for him to break through. Given what he did at Triple-A in 2011 and the virtual impossibility that the Royals could get the same kind of performances out of their outfielders, we identified Cain as an early 2012 sleeper. Well, it took some time because he had to deal with some not-so-minor groin issues this year, but he did wind up having somewhat of a breakthrough. Well, at least he finally got a more extended opportunity to strut his stuff. When Cain was finally healthy in mid-July, he highlighted our waiver wire recommendations and it was a solid choice as he enjoyed an extremely productive July before struggling to make contact in August. However, Cain finished on a high note, putting up a whopping 895 OPS in September before having to shut it down a couple of weeks early with a hamstring injury. Ah yes, a microcosm of Cain’s career to date – just as he starts to roll, he gets hurt. But that brings us to 2013, when Cain will again be a serious sleeper. Why? Well, for starters, he’s penciled in as the team’s starting centre fielder and he’s coming off a season that he put up a WAR of 1.9 despite playing less than two-fifths of the season. We don’t need to tell you how big that could project to with a full season worth of at-bats. More reasons for optimism: Cain showed progress in his walk rate (yes, there’s plenty of room for growth there, but…), he’s entering his magical age 27 season, and he looked fantastic on the basepaths (10-for-10) and could be capable of swiping 25 bases with close to 20 dingers. Cain’s 735 OPS, while a nice improvement, could grow much higher. Oh, and he’s been working hard all offseason to strengthen his legs to help shake the injury bug. Cain will need to make better contact if he’s going to take it to the next level and for us, that will be the key development to watch next season – can he reduce his strikeout rate down to around 16 to 17 per cent? We’re not the only ones thinking Cain could be a steal. Last month, before they signed B.J. Upton, the Braves kicked the tires on a trade with KC to land Cain to fill their CF hole. This dude is not just about speed; he has some pop and has shown the ability to hit for average. If his walk rate continues to develop and he makes better contact, look out. And just think, Cain will be available so cheaply at your draft next year. 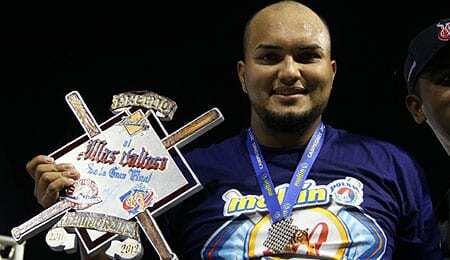 Back in July we talked about how Yusmeiro Petit looked ready for another shot at the majors. He enjoyed a really nice season at Triple-A in the Giants’ system, showing superb command and was rewarded with a September promotion despite not being on the 40-man roster. Petit made one spot start for the Giants and while he wasn’t rocked, his command was suspect. After the season, he headed to Venezuela to play Winter Ball. It was Petit’s start last week that caught our eye when he tossed eight shutout innings of three-hit ball – the kind of performance that gets the attention of big league teams. He followed that up Wednesday with another quality start and while his results in Venezuela haven’t been great, they’ve really been stilted by back-to-back stinkers among his five starts. Could this dude get a shot at a rotation spot next year? Perhaps you heard a thing or two about the Angels adding Josh Hamilton, but that’s not the only recent move the Halos have made to beef up their outfield. A couple of weeks ago, the team claimed Scott Cousins off waivers from the Mariners. Of course, just a couple of weeks earlier, Seattle had claimed him off waivers from Toronto, who, a couple of weeks earlier, claimed him off waivers from the Marlins. Think Cousins’ head is spinning? Cousins, who turns 28 next month, saw his most action ever this year, but he showed only modest improvement and still doesn’t get on base enough to be a factor. Yes, we considered him a waiver wire worthy candidate early last season, but it wasn’t one of our best calls as he barely saw any action after April. Cousins will get a shot to win a bench job, but looks very much like an organizational player at this stage of his career. This entry was posted on Friday, December 14th, 2012 at 12:06 pm	and is filed under BASEBALL, Fantasy Notes, Player profile, RotoRob. You can follow any responses to this entry through the RSS 2.0 feed. Both comments and pings are currently closed.